Matteo Guidicelli considers <em>My Bindondo Girl </em>leading lady Kim Chiu a \"blessing\"
Matteo Guidicelli considers My Bindondo Girl leading lady Kim Chiu a "blessing"
"I’m super blessed. I’m very, very happy, that’s why I give back for Habitat for Humanity and other charity and stuff. I always try to give back and make people happy, that’s it," says Matteo Guidicelli about how blessed he is this year with ABS-CBN. Matteo Guidicelli is very blessed this year. Gianmatteo Vittorio Fernan Guidicelli, or famously known as Matteo Guidicelli, is a Filipino-Italian racer turned model, singer, and now an actor. He was last seen in ABS-CBN primetime with Andi Eigenmann in the primetime fantasy series Agua Bendita. PEP.ph (Philippine Entertainment Portal) got a chance to interview Matteo last night, August 18 at Star Magic’s Reach for the Stars: A Concert for Humanity in Glorietta 4’s Activity Center in Makati. PEP asked Matteo about his working relationship with Kim in My Binondo Girl. "Oh, I’m really blessed. I’m very, very excited for August 22, we’re gonna start showing. 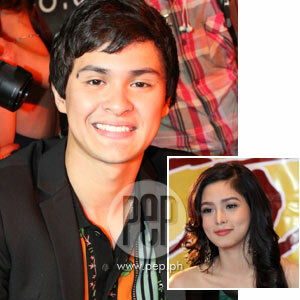 "Kim’s a blessing to me and ahm… My Binondo Girl, I’m very, very excited, I’ll be on primetime again," he said Matteo. Matteo has been very blessed this year by ABS-CBN. How does he feel about it? "I’m super blessed. I’m very, very happy, that’s why I give back for Habitat for Humanity and other charity and stuff. "I always try to give back and make people happy, that’s it," he enthused. He added, "I’m just being happy with Happy Yipee Yehey! and My Binondo Girl. "Happy Yipee Yehey! is amazing and great. I love the people and I love how we make them happy." Matteo will be very busy these days because of Happy Yipee Yehey!, which airs daily, and My Binondo Girl, which they tape thrice a week. MAJA SALVADOR. PEP then asked Matteo about rumored girlfriend Maja Salvador. How are they? "It’s good. We’re close, we’re friends, you know. "We’re happy. Everything’s good," Matteo responded briefly. Do they go out on a date? "We go out on group dates," he replied. How about only the two of them? "Not yet. Soon. We’ll see." FAVORITE HERO. On August 29, the Philippines will be celebrating National Heroes Day. Matteo was asked about his favorite hero and why. "Dr. Jose Rizal," he immediately answered. What traits he likes most about Dr. Jose Rizal? "He’s a man, you know, he’s amazing. "I think he’s so bright. He’s so intelligent. "He’s so educated and he fought for the country—that’s the most important thing." What’s that one trait of Dr. Jose Rizal he thinks he has as well? "Ahm…he’ll never give up. He never gave up. I’ll never give up." With everything that Rizal has done, what did you like the most? "When he died for the country, you know. He gave everything—his whole life for the country, so it’s amazing, it’s an amazing thing." Matteo said that he would do "anything" for the country. "I love the Philippines!" he said. "Even though I’m half-Italian, I love the Philippines—I consider myself Filipino. "I’ll do anything for it [Philippines]. "Just wanna make the people happy. "Also help the unprivileged Filipino, you know. Doing Habitat for Humanity and just help."